Don’t think humor is a serious business? It’s more than the best medicine: it’s good business. 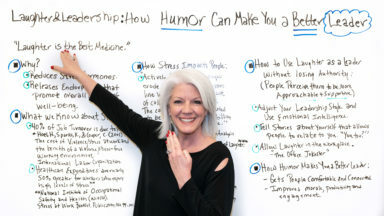 Jennifer Bridges, PMP, shows you how leadership is bolstered by laughter. Everyone gets bored at some time. But at work there is always something to keep you busy. 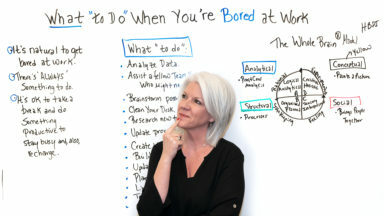 Jennifer Bridges, PMP, helps you get over boredom at work. 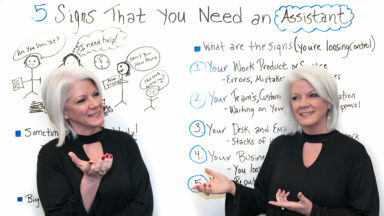 Everyone thinks they should have an assistant, but do you really need one? 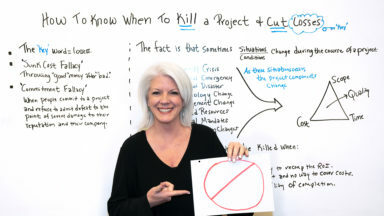 Jennifer Bridges, PMP, shows you the signs that point to yes. You work hard and deserve a vacation, but the thought of returning to an avalanche of work is keeping you at your desk. 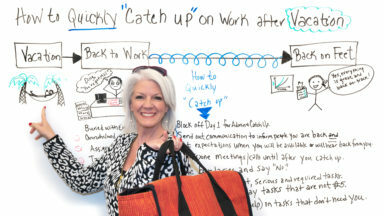 Jennifer Bridges, PMP, shows you how to catch up quickly. How do you know when it's time to quit? 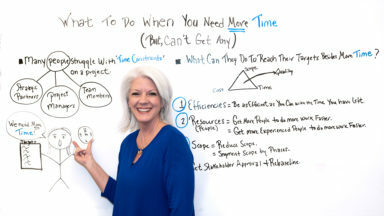 Jennifer Bridges, PMP, shows you how to decide when it’s time to move on to better opportunities. When you’re a CEO your duties can vary depending the organization and industry. 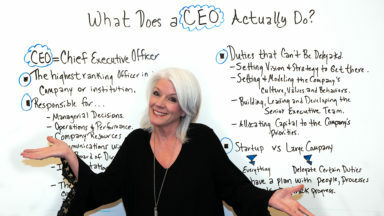 Jennifer Bridges, PMP, explains what it means to be a CEO. 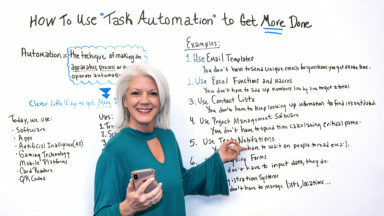 Learn how to use task automation to get more done and improve your project management. Watch the video to learn more. 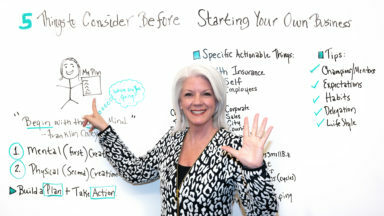 Starting your own business is a project, and Jennifer Bridges, PMP, shows you the five things you’ll want to think about before you start. Time management is a critical skill at work. 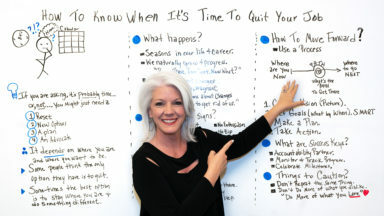 Here's a few tips for getting more out of your time when it feels like the clock is running out. Sometimes things just don't work out as planned. In such cases, it's critical to know when to cut your losses and move on. What Is Synergy, and How Can It Help My Management? Synergy might sound like a joke, but it offers real benefits. Learn how to use synergy to improve your management skills. The only constant in a project is change. 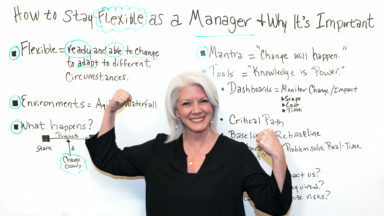 Jennifer Bridges, PMP, shows how important it is to keep flexible as a manager. 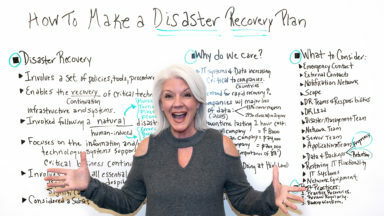 Learn how to react to both man-made and natural disasters with a diaster recovery plan. Follow these tips and protect your business. 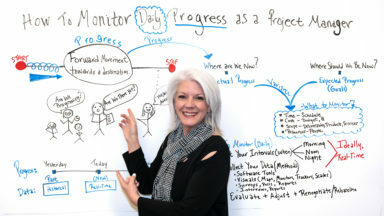 Project managers love to monitor everything, so it’s only natural that managers want to monitor daily progress on their projects.